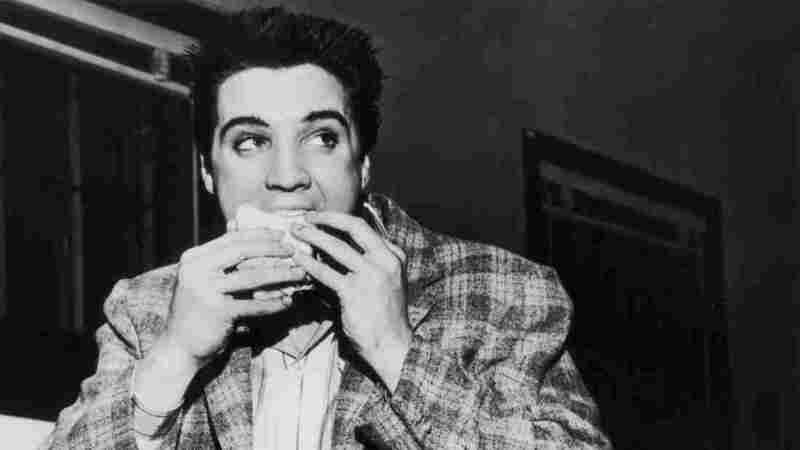 Elvis Left The Building Long Ago, But His Food (And Music) Lives On : The Salt Presley's legendary love for peanut butter and bananas and bacon helped lead to his outsized body toward the end of his life, and a lasting food legacy. And, oh yeah, he could sing too. A still-trim Elvis Presley enjoys a sandwich in 1958. His love of fatty foods hadn't caught up to him yet. Elvis Presley was better known for his music than his gourmet tastes. But he did have a famous affinity for the fried goodness of the American South — and he had the waistline to prove it. In honor of what would have been the King of Rock 'n' Roll's 78th birthday, let's take a look at some of his legendary eating habits. His famously beloved fried peanut butter and banana sandwiches — or "peanut butter and 'nanner sandwiches," according to Are You Hungry Tonight, a cookbook of his favorite recipes — were basically peanut butter and sliced banana between two pieces of white bread, fried in butter. Butter seems to have been a frequent part of Presley's diet, contributing to his weight gain before his untimely demise at age 42 in 1977. By that time, "Elvis had long been gobbling drugs and fatty foods," Graeme Wood writes over at the now-defunct The Daily. "But his romance with saturated fat reached a sort of point-of-no-return 18 months before the end, on a chilly night that started at Graceland, his estate in Memphis, Tenn."
Wood recounts the story of Presley's famous flight to Denver one night to get a sandwich that topped even his old familiar favorite. One night in 1976, the King started reminiscing about Fool's Gold Loaf, a sandwich he'd once eaten at the Colorado Mine Company in Denver. It cost $49.95 at the time — $189 in today's dollars, Wood says. Apparently, Presley's craving was so intense that he and his entourage jumped on his private plane and jetted off for the two-hour ride to Denver — a midnight junk food run that totaled $16,000, says Wood. Far be it from us to advocate anyone eat like Presley (as we've told you before, all that bacon could be the death of you). Still, those curious about the King's other culinary ways can dive into these recipes from the authorized cookbook, Graceland's Table: Recipes Fit for the King of Rock and Roll. Or you could try a modern interpretation of Elvis' immortal beloved snack — The Elvis Presley Milkshake, from Charleston, S.C.-based chef Sean Brock. He shared the recipe for All Things Considered's Found Recipe series. Every January 8th, Brock works peanut butter and banana into the menu at his restaurants. One year, as he was serving cheeseburgers to his staff, the idea of a milkshake hit him. "[I]t was kind of weird, especially with the bacon in the milkshake, but it turned out to be delicious," Brock says. Listen to All Things Considered's story later for more details, but here's the recipe if you just can't wait. In a large skillet over medium-high heat, fry the bacon until very crispy, about 6 to 8 minutes. Drain the bacon on paper towels. Reserve the rendered bacon fat separately, allowing it to cool slightly. Place the bananas, peanut butter and bourbon in a blender. Add the cooked bacon and 3 tablespoons of the reserved bacon fat and blend until smooth, about 45 seconds, scraping down the sides if necessary. Add the ice cream and pulse to incorporate into a smooth shake, about 30 seconds. If you'd like, you can also incorporate the ice cream by hand by mixing it in with a whisk or an immersion blender; this will help keep the shake in a more frozen state. Serve immediately. Transfer any extra shake to a lidded container and reserve in the freezer. Because the alcohol prevents it from completely freezing, it turns into a scoopable ice cream. P.S. : It's also the birthday of another famous rocker — David Bowie. It's highly unlikely that the now 66-year-old Thin White Duke ever ingested 100,000 calories a day, as some sources have suggested Presley did toward the end. Of course, Bowie's still kicking — and rocking. As our friends at All Songs Considered note, the singer is celebrating the day by releasing a new song. Over at Flavorwire, check out a slideshow of Bowie doing ordinary things, like eating airplane food, cutting his birthday cake, and more recently, food shopping.